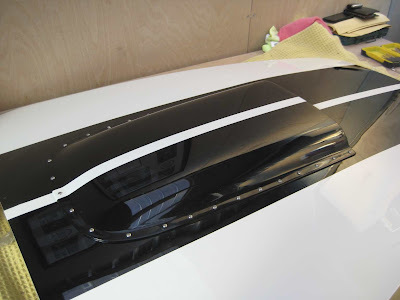 I received the bonnet back yesterday from Carsmetic and Stuart had done a great job of repairing the damage caused where the gel coat had broken through when I drilled the scoop fixing holes. He had also skimmed the scoop and painted it the same colour as the bonnet. 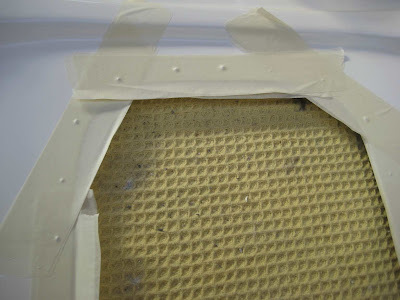 As the scoop fixing holes had been partially filled I decided to apply masking tape to the underside of the bonnet and then to re-drill using the drill in reverse to reduce the amount of breakout. This worked pretty well with just one or two bits of breakout this time. Although not necessary to hold the screws in place as I'm using M4 nyloc nuts, I put some slightly oversize washers on to cover the bits of breakout. Although not necessary to hold the screws in place as I'm using M4 nyloc nuts, I put some slightly oversize washers on to cover the bits of breakout. 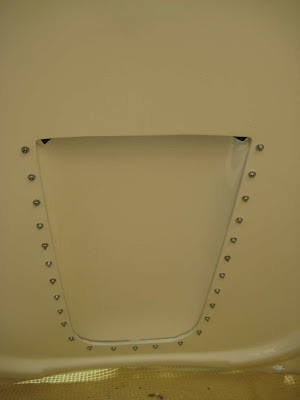 Scoop bolted in place using M4 x 20 button heads and M4 Nylocs. Oversize washers hide any breakthrough caused by drilling the holes.